Research from the Office for National Statistics (ONS) shows that women in graphic design get paid 6% less than men, while female product and clothing designers get paid 18% less. 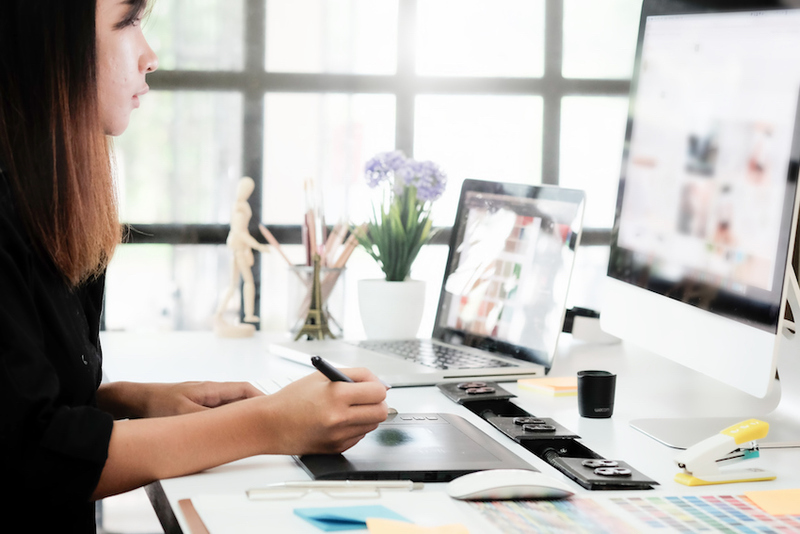 Women working as graphic designers earn nearly 6% less than men in the same field, research from the Office for National Statistics (ONS) shows. The online gender pay gap calculator analyses data taken from across the UK in 2017, and lets users look at the discrepancy in pay between men and women in different professions. Gender pay gap is the difference between average hourly earnings of men and women across a company, organisation or a profession. It is different from equal pay, which means that men and women performing the same job role must legally receive the same pay. The ONS’s calculator splits “design” up into five different professions; graphic designers; product, clothing and related designers; web designers and developers; IT business analysts, architects and systems designers; and design and development engineers. While the pay gap is based on hourly wages, annual wages often show an even bigger difference because women often work less hours in a year than men. This is down to many reasons, such as women being more likely to work part-time jobs, or take time off to look after children and family. The research shows female graphic designers are paid 5.6% less than men, at £12.59 per hour compared to £13.33 per hour. Women take away roughly £22,000 per year and men take away £26,000. Women hold nearly a third of jobs in the sector. Product and clothing designers see one of the biggest gender pay gaps at 18.3%, with women earning £12.95 per hour compared to men’s £15.84. Women earn roughly £26,000 per year while men earn £33,000, despite women holding most of the jobs at nearly two thirds. Web designers and developers see a comparatively small gap, with women earning 2.1% less than men, at £15.39 per hour compared to £15.72. Still, on average, women take away £26,000 per year compared to men’s £31,000. See the ONS’s gender pay gap by occupation calculator here. The gender pay gap across all the UK’s industries is complex, and is down to more than just “women get paid less than men”. Other key reasons that have been cited include more women working in lower-paid sectors; women being more likely to work part-time, which means a lower annual salary; and women having less access to climbing the career ladder and landing senior roles, which can be down to taking maternity leave, taking time off to care for families, lack of flexible working, and a company’s culture and attitudes to gender roles. Bigger pay gaps in more traditional sectors? The design industry has shown itself to be no exception to the gender pay gap; according to the Design Council, the average salary in the industry is £635 per week, with most women earning 68% less than this. Specifically, it looks like the biggest gender pay gaps are in more traditional fields like product design while newer fields such as web design see men and women sit on a more level playing field. Sarah Weir, CEO at Design Council, says that the product design industry is still “heavily male-orientated”, while digital design fields “employ a younger, more diverse workforce”, showing that “social and cultural conditioning” probably pays into gender pay gaps. Erika Clegg, co-founder at Spring, adds that different design sectors have varying attitudes to pay based on demand for jobs and competitiveness. To tackle this attitude, she says that designers need to make clearer the value of the work they are doing to their clients in order to get the fees they deserve. She also adds that women should be trained in recognising their own skills and values too, and in “pushing harder” for fair pay while learning to dismiss the feeling of being “difficult” for doing so. “Demonstrate your value and it becomes the reason to hire and retain you – not your inherent niceness,” she says. However, Deborah Dawton, CEO at the Design Business Association (DBA) says that the onus should not be put on women to be more assertive in the workplace to get a fair deal – this should be tackled by companies themselves. Suggestions she makes for design businesses to do this include making jobs at all levels available on a more flexible basis; hiring an equal number of men and women when recruiting, for a better gender balance; being “unbiased and thoughtful” about opening up promotions to everyone; and having pay scale structures in place. Weir adds that while addressing gender pay differences is key, there are several other issues that companies also need to look at to help women climb the career ladder more successfully. “We also need equality in other benefits such as maternity and paternity leave, and childcare, to build a genuinely diverse, equal and positive workforce,” she says.